WOW! What a meeting! 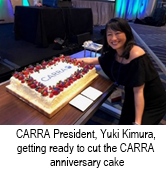 CARRA turned 15 this year and celebrated with (cake and) its largest annual meeting to date! 469 CARRA members and guests attended our 13th annual meeting at the Marriott Marquis Houston where over 40 preconference and working group meetings were held over the course of our 3-day meeting. Click here to see CARRA’s growth in sites, members and meeting attendees over the years and click here to view our final meeting program. Read more here. What Caught our Eye: Adverse Childhood Experiences and Autoimmune Disease--Is There a Link? Have you ever wondered, even if just a little bit, why it is that for every complex genetic trait, whether it’s coronary artery disease, type 2 diabetes, or preterm labor, prevalence rates are always higher in economically challenged, socially marginalized, and historically traumatized populations? I have been pondering this question for more than 15 years. As a Native American person, I can tell you that our communities are pretty tired of being told, “It’s because you have bad genes,” and we’re not buying that answer anyway. Read more here. The CARRA Registry is excited to be enrolling new onset lupus patients as of March 1, in addition to enrolling patients with select categories of JIA. We also have great news: we will be expanding our JIA enrollment criteria in the very near future to include all patients with JIA! Currently, we have 3162 subjects enrolled! 205 of 400 STOP-JIA (Start Time Optimization of biologics in Poly-JIA) enrolled (10 with biosamples). 9 of 200 FROST (FiRst Line Options in Systemic JIA Treatment) subjects enrolled (2 with biosamples). Please try to enroll all new poly JIA and systemic JIA patients in STOP-JIA and FROST if your site is participating. AND it is very important that we collect SAMPLES on these patients (prior to starting treatment if at all possible). PEPR is a new NIAMS funded study that recently launched enrollment. It will enroll SLE and JIA patients at select CARRA Registry sites. The primary aim of the PEPR study is to validate PROMIS measures in chronic pediatric diseases. Congratulations to UCSF (Emily von Scheven (PI) and Bhupinder Badwal (SC)) for enrolling the first PEPR patient! CARRA ELECTIONS: Round 2 Results—Congratulations! The results for Round 2 of the CARRA elections are in. Congratulations to (pictured from left to right, top to bottom) Tova Ronis (newly elected Publications Committee Chair), Jay Mehta (newly elected SVARD Vice Chair), Lauren Henderson (newly elected as TRTC Vice Chair), and Marsha Malloy (newly elected as RAAC Vice Chair). Small Grant awards up to $25k each will be offered twice a year. (Deadlines now October 1 and March 1). Large Grant awards up to $50k each will be offered once a year. (LOIs due September 1; applications due October 1). Publication Support grants up to $10k each are awarded on a rolling basis. Up to 5 per year. New Fellow Research Grant awards up to $25k will be offered once a year (Deadline March 1). Fellows who will be in their 3rd or 4th year in July 2018 will be eligible. For more information on CARRA grants click here. All health care plans are not created equal and quite frankly, they can be confusing and burdensome to navigate. For some, understanding the healthcare system and related services is as difficult as understanding their disease. Our Prescription for Access initiative provides tools, tips and resources that will help patients and families better understand health coverage options, learn how to get needed arthritis care and manage claim denials. Learn more about Prescription for Access. The Arthritis Foundation offers a JA Power Pack – a toolkit with useful information and tools to assist newly-diagnosed children and teens, as well as their parents. These resources are designed to give patients and their families the power to make living with JA easier. Knowing what to expect and how to deal with it is the key to better living with JA. Patients can visit http://www.japowerpack.org to register.